Hayemaker Promotions is delighted to confirm that a number of up and coming British fighters have today been added to the Haye Day undercard at The O2 in London on May 21. Following last week’s announcement that an English middleweight title fight between Joe Mullender and Lee Markham will be chief support, a raft of young Brits will also be in action at The O2 including; lightweight Floyd Moore; light welterweight Kay Prospere; light heavyweight Ollie Patterson; heavyweight Nick Webb; and light heavyweight Tony Dodson. 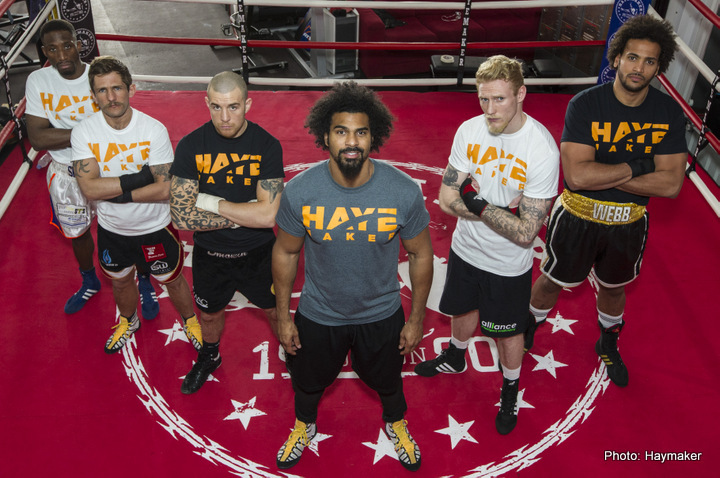 Haye, the Former World heavyweight champion, pledged when Haye Day returns to The O2 in May it will build on the success of his comeback fight earlier this year and another electrifying night of entertainment is in store. Making his return to The O2 Arena is Luton-based light welterweight Kay Prospere (7 (5) – 0 – 0) who will be hoping to stake his claim for a title shot in 2016. In his appearance at The O2 in January, Kay made short work of Lee Connelly with a first round stoppage. Liverpool’s Tony Dodson (32 (15) – 8 – 1) is another man who will be making a return to The O2, having survived a bloody encounter last time out against Richard Horton. The former British super middleweight champion is taking steps towards titles, now in the light heavyweight division. Crowd pleaser Floyd ‘Pacman’ Moore (12 (9) – 6 – 1) is no stranger to big events, having previously taken part in the Prizefighter tournament, as well as being a two time Southern Area champion. He fights at The O2 for the first time. Light heavyweight prospect Ollie Pattison (2 – 0 – 0) is making waves in the division as he looks to position himself towards a light heavyweight title in 2016. The 6’ 3” London Colney fighter is looking to stretch the unbeaten start to his career and make a mark in a busy domestic weight division. Surrey-based heavyweight Nick Webb will also be joining the bill following an emphatic rise up the professional ranks. During his short professional career, Webb has managed to win all four of his pro bouts convincingly by KO. Following the success of Haye Day in January, when a 16,000 capacity audience that included Hollywood stars Benedict Cumberbatch and Idris Elba at ringside, Goodwin Promotions are once again be supporting Hayemaker Promotions to assemble the undercard. Tickets to Haye Day at The O2 on May 21, are available on general sale now via AXS.com and hayemaker.com.